My name is Miracle, I am 17. I have been playing Runescape since late 2005, and I have been on and off since then. I come from a small town in Southern California where nothing really happens often. I just finished my Junior year in High School, but I will be home-schooled next year due to health issues within the family. I made my skiller account today actually. I was bored and thought "I want to start from scratch!" I have the next few months off before home-schooling begins and I won't have as much time to play anymore. 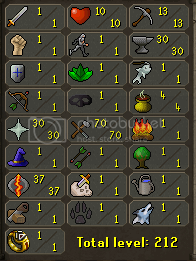 My goal is to get as many f2p stats to 70+ and hopefully get at least one 99 stat. I will update this blog at the end of every day to show my progress as it moves on these next few months. Love the life you've got, because you never know when it'll be taken away. Good Luck with your goals Miracle! I will be following your f2p progress ! Nice, I have a F2P Skiller aswell, check it out! Glad to see another F2P'er. Good luck with your goals, I'll definitely be checking back. btw - how have you been training Crafting?